Em Cooper is an Emmy nominated British director and animator specialising in combining oil-painted animation with live-action film. Em’s interest in communicating subjective experience informs her approach to creating moving images. Her critically acclaimed, highly distinctive method of filmmaking involves combining oil paint animation with live-action film and is often described as evocative of inner experience. 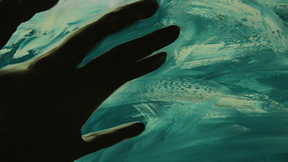 Em’s animated work is painstakingly hand painted frame by frame, using oil-paint on glass. In 2018 Em directed oil-paint animated TV commercials for Berghaus and Andrex in partnership with Water Aid. Her recent film and documentary work includes sequences for Amazon Prime’s award winning TV series, Gortimer Gibbon’s Life on Normal Street and Deej an America ReFramed feature documentary directed by Robert Rooy, broadcast on PBS. In 2014 her oil-painted animation woven throughout Eric Steel’s feature film Kiss The Water received critical acclaim by the British press, impressing the critics of Time Out, The Times, The Observer, The Financial Times and The Telegraph. Kiss The Water was named as one of the ten best documentaries of the year by BBC film critic Mark Kermode, and was screened on BBC television in 2015. Em’s short films have been screened internationally, including at the 2013 Sundance Film Festival. Her animation installation work has been exhibited at Turner Contemporary, Margate, and her films shown and discussed at the Freud Museum, London. Em has been invited to present her work at conferences including the European Psychoanalytic Film Festival in London and the International Ferenczi Conference in Budapest. In 2015 Em won the Gradiva Award for film at the National Association for the Advancement of Psychoanalysis, which rewards creative work advancing psychoanalytic understanding. Em was nominated for an Emmy Award in 2018 for her animation on Deej, in the Outstanding Art Direction and Graphic Design category. In 2013 Em won the YCN Professional Award for Animation. She graduated from the Royal College of Art in 2010 and her film Confusion of Tongues was shortlisted for the 2012 British Animation Awards, Best Student Film. Prior to her MA, Em worked as an Editor and Associate Producer at Current TV, UK. A recent interview with Em in ROOMS Magazine can be found here.